Peaches are delicious eaten fresh out of hand, but they are also wonderful in cooked dishes, both sweet and savory. Before cooking, be sure you how to properly select and store peaches. Cobbler, pie, and Melba are the most well-known dishes using peaches. Peach Melba was created by famed French chef Escoffier in honor of Australian opera singer Nellie Melba. The basic melba recipe consists of half of a peach poached in syrup, topped with vanilla ice cream, and garnished with raspberry puree. This recipe has been adapted to be used with many different fruits. Other popular peach uses include jelly, jam, ice cream, fruit leather, liqueur, and brandy. Washing peaches will remove most of the fuzz. Although the fuzzy skin is perfectly edible, it becomes tough when cooked. To remove the peach skin, blanch in boiling water for one minute and then immediately plunge into cold water to cease the cooking process. The skin should easily slip off. Do not let the peaches soak in the water. Nectarines, apricots, plums, pluots, cherries, or mango may be substituted for peaches in equal measure in most recipes. 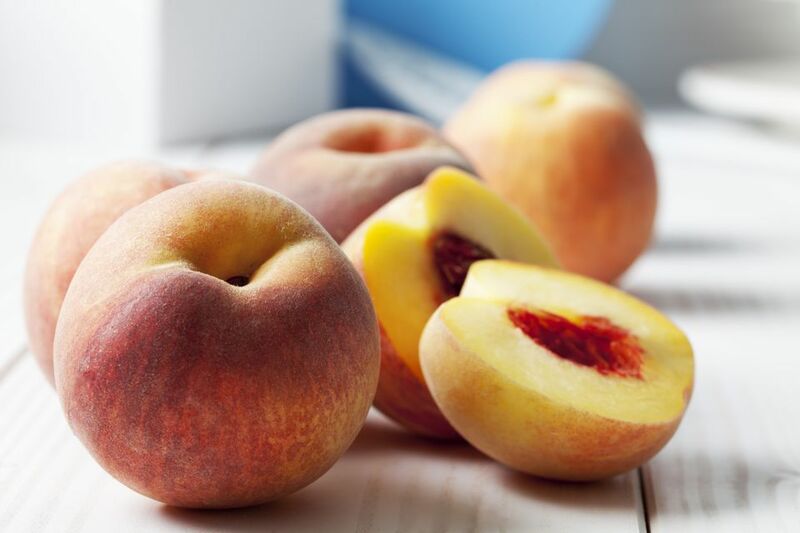 The flesh of peaches will darken with exposure to air, so they must be cooked or eaten immediately once cut or further treated. The darkening can be retarded by dipping the cut pieces in an acidic juice of citrus or pineapple, either diluted with water or full strength. For sweet dishes, you may prefer to use pineapple or orange juice as the acid rather than the more tart lemon or juice. For savory dishes, lemon or lime is usually the choice. Ricotta cheese, mascarpone cheese, and cured meats are all excellent paired with peaches. For a simple, yet elegant dessert, try vanilla bean ice cream topped with sliced peaches and a generous sprinkling of Grand Marnier or orange liqueur.